Laser-engraved headstones show images of Bosnian Serb soldiers who were killed during the war. The cemetery is in Visegrad, in eastern Bosnia, a town where some 2,000 Muslim men and boys were killed by Serbs in the spring of 1992. Eight years after the end of the war, the former Muslim-majority town remains overwhelmingly Serb. 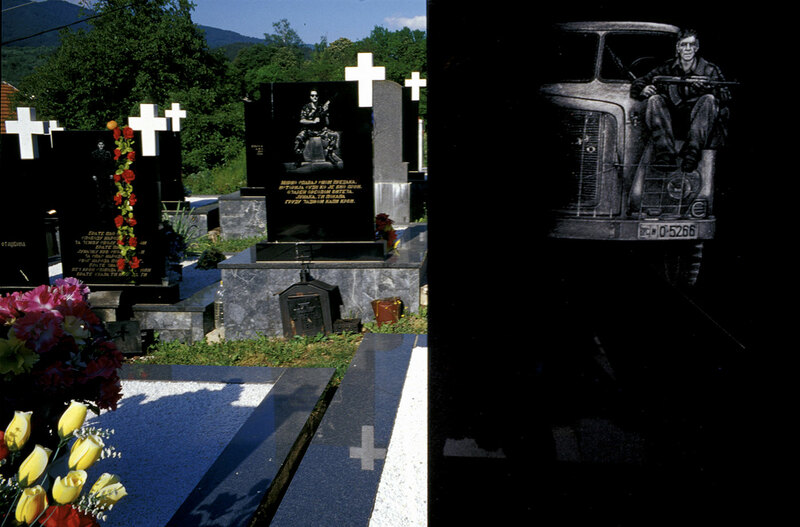 • While the title of this photograph is singular, “Headstone,” two black granite headstones occupy a prominent position in the image’s composition—both with laser-engraved images of the deceased (presumably) holding a gun. Why do you think Sara Terry chose to focus on these headstones? What larger story is being told about the community where this cemetery exists? • These headstones honor dead warriors who are buried in the town where they helped to kill some 2,000 men and boys. How does the composition of this photograph remind us of the loss that has taken place? Why?